After the tragic deaths of over 1,200 Bangladeshi garment workers in factory fires and building collapses, U.S. retailers must take responsibility for the conditions at the factories that produce their clothing. The groundbreaking "Accord on Fire and Building Safety in Bangladesh", will take meaningful steps towards ensuring safe working conditions in garment factories. Unfortunately, most U.S. companies won't sign the agreement. Gap, Banana Republic, North Face, Timberland, American Eagle, Target, Sears, Old Navy, Walmart: STOP THE BLOODSHED. Sign the Accord. Join 99 Pickets, Desis Rising Up & Moving (DRUM), United Students Against Sweatshops, NYNJRJB Workers United, the YaYa Network, Student Labor Action Movement, UAW, New York CLC, and the Rude Mechanical Orchestra in a mass funeral march to shame and call out U.S. retailers that haven't signed the Accord. WHERE: Petrosino Square, near Spring St. & Lafayette St. in Manhattan. We'll let SoHo shoppers know about these corporations' murderous inaction. It's not as if the agreement is unworkable: H&M, Joe Fresh, Calvin Klein, Tommy Hilfiger, Zara, Primark and 40 other apparel and retail companies that have signed on to the Accord. The Accord on Fire and Building Safety in Bangladesh, a new agreement between global union federations and 40 prominent apparel and retail companies, requires companies to participate in and fund a program of independent safety inspections, remediation, and worker safety trainings with the involvement of trade unions. The time for individual and ineffective “corporate social responsibility” programs is long over. The legally binding, multi-stakeholder Accord is the kind of framework that is much more likely to result in safer factories and better jobs for garment workers. Ready to Jam a Walmart Near You? Great! Here’s How. The “Unstoppable” and “Fightback!” price cards are ready to print and copy onto 8 ½ X 11 card stock. Cut ‘em youself! The “Lower Wages Guarantee” sign can also be printed on 8.5 X 11 with little cutting (Those are the same size and look as signs right by the cash register… Just sayin’). The red banner-type signs (“Poverty Pay”, “Inhumane”, ”Solidarity” are formatted so you can print them on legal size paper and they’ll be just the right size for the displays in the store. After you print them on legal paper, cut them. 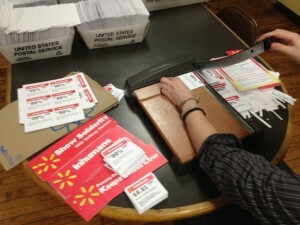 Then copy them two at a time onto 11 X 17 card stock. There are plenty of places for the price cards. Anywhere you see one of theirs, you can put one of these! The banner-type signs fit a few different kinds of displays. They should fit over the text of longer signs that are the same height. Just look like you’re supposed to be doing what you’re doing. Smoooooth! No need for tape, or clips! 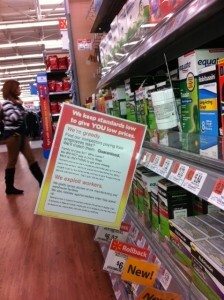 Have another message for Walmart shoppers? Make your own signs! Go scope out you local Walmart to come up with ideas. Act on Good Ideas! There are a lot of peaceful, creative, fun way to clear the eyes of those blinded by corporate-driven consumerism and send a strong message to the corporate crooks themselves. Choose yours! Make people laugh. Make people think. Cause consternation. Challenge the consumer to re-examine his/her environment and choices, but be creative not destructive! Send photos and videos (at your own risk and discretion) of signs you’ve posted to our Rebrand Walmart tumblr! 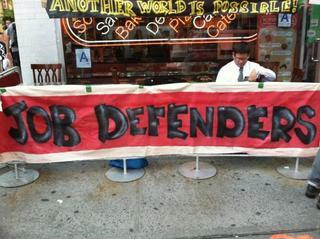 New York, NY, August 31 – Following news of an impending store closure, workers at the 63rd street location of Hot and Crusty bakery have called for a 24-hour picket and store occupation, alleging the company has deliberately withheld rent payments following a hard-fought and successful unionization drive in May 2012. The company, owned by private equity partner Mark Samson, gave the Hot and Crusty Workers Association 11 days notice of eviction from the property, informing employees that August 31st would be their last day. The union, led by grassroots labor organization Laundry Workers Center and a contingent from Occupy Wall Street, students, faith and community members are occupying the workplace and holding an around-the-clock picket demanding the company discontinue its union-busting tactics, pay its rent immediately, and continue to negotiate a fair contract with its workers. The company has used several bait-and-switch tactics during negotiations, threatening workers’ immigration status to deter their commitment to continuing the fight. The August 31 closure will mean the loss of 23 jobs – including those of employees with as many as twelve years of employment with the company. Workers allege owners, including Mark Samson, Evangelos Gavalas and Nick Glendis, have a demonstrated history of wage and hour violations, intimidation, retaliation and harassment of workers in several of their businesses, as well as a pattern of closing down shops and opening under different aliases to avoid legal and economic liability. Workers have filed charges at the National Labor Relations Board alleging that the company is closing the 63rd street shop to intimidate workers organizing at other Hot and Crusty locations.